1. I turn 30 in a few months, and I’ve never had a “real” birthday party in my life. 2. I like so many different kinds of music, it’s unreal. I mix in some hard rock, some country, some pop, some rap, some classical, some jazz, some electronica… and I love all of it. Music makes me happy – and being involved in the music program at my high school definitely helped keep me from dropping out. 3. I can’t sing or run, but I desperately wish I could do both. 4. I have already written my black-belt speech in my head. I have about another year or so before I test for my black belt in tae kwon do – the hobby/pastime/obsession I have given almost all my free time to over the past few years. Each black belt is asked to give a speech about their journey, and I’ve been crafting the gist of mine for some time, after having heard some of my friends’. Lately, as I’ve gotten closer, it’s gotten almost “finished,” and I cannot wait to give it. 5. I love public speaking and almost never specifically plan what I’m going to say beforehand. 6. One of the things that makes me cry tears of joy is being part of a new idea. I cried watching Moneyball. Moneyball! (And reading the book version of it.) Seeing someone think differently is awe-inspiring to me. I just get overwhelmed at the idea of big, sweeping new ways of looking at something and am so impressed by them. I used to have big goals. I wanted to be an oncologist, a cryptanalyst, lots of “fancy” things. I wanted to live in a big city and go out with important people. I used to want to invent something or discover something or prove something that changed the world. I wanted to run my own company and do Big Things. My dreams now are so simple. I want to do “small things” and do them well. I want to write things that make people smile or try something new or realize they’re not alone. I want to capture the stories and memories of life in my town. I want to have an organized house and a welcoming living room and a dinner table that always has room for one more. I want to be remembered for having a contagious smile. A very good friend once told me that while it’s important to be a candle, it’s also important to be a mirror that reflects the light, and I like to think I make a good mirror. 8. I like to play Facebook games – a lot. 9. I was adopted at birth. 10. I can’t draw, but I love making collages. My collage art is probably one of the most personal things I’ve done; only a handful of people had seen any of it before I got brave and shared some highlights on Facebook earlier this month. I have dreams of making and selling them someday at the local farmers’ market. This is my self-portrait. “Brainy, blond and ready to rumble,” it’s called. 1. I am a member of the National Geographic Society. I even have a card that proves it. I really, really like National Geographic. They are the best. When you go onto their website, you always see something new, and they always keep you up to date on things that they find out, like about the water on Mars, new animals in the world, our big cats who are endangered, stuff like that. Animals mean so much to me. That’s why I want to be able to become a pet groomer and have a zoo, and especially have a special part if I get a zoo that has our big cats who need help and a money donation jar that people can put money in to help our wild cats to keep them protected. 3. I love to write songs. Writing songs is fun. It’s another hobby that’s fun because it doesn’t have to be anything in particular. It can be whatever I want it to be. 4. I love making new friends. Making new friends is fun because then you get to know somebody that you don’t know, and they get to know you. It’s a great way to get a conversation going. There’s all kinds of things you can talk about, things that you have in common, sports that you like, if there’s anybody in the Olympics that you in particular were looking to watch. 5. I really like Twitter. It’s a great place to follow zoos and Storage Wars and American Pickers and other stuff I like. 6. I like playing my Ninendogs and Cats game on my 3DS. The game reminds me so much of my dog and cats at home. Plus I just like video games. Music is fun to listen to, especially on a rainy day, because it helps you forget about if something went bad or something. I have an iPod shuffle that has a lot of songs that I like and that me and my mom like together. I am really excited to be able to go to 2 concerts in September, for Celtic Thunder and David Byrne. 8. I like writing stories. I like writing whatever comes to my mind. I especially like funny stories. Long stories are good because they give more detail in chapters or in some cases, with pictures. I think I’d like to write a book but I can’t decide what about. 9. I am in 4-H.
4-H is very fun. I like it because I made a lot of new friends. We go on a lot of hikes, we make soap and butterfly hatcheries and bird baths and stepping stones, and learn about wildlife. 10. I love to draw designs that turn into something. I made a lightning dragon by myself during my last school year. These are 2 of the drawings I made around maybe two years ago. At the top of this one is a scar fire-breathing dragon, because right on his wing is a scar. At the right, the little guy is another different version of one in the picture below but smaller. 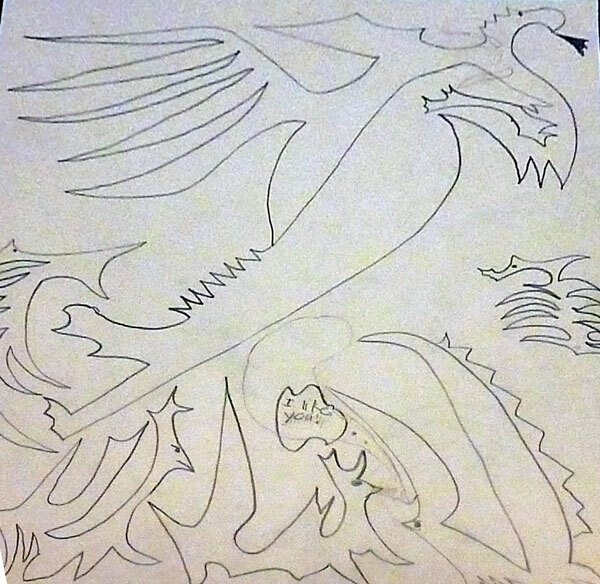 The bottom right is a mountain spike fox, the one saying “I like you” is a phoenix fox, and the one at the bottom left is another version of it. And off to the left is basically a three-winged fox. 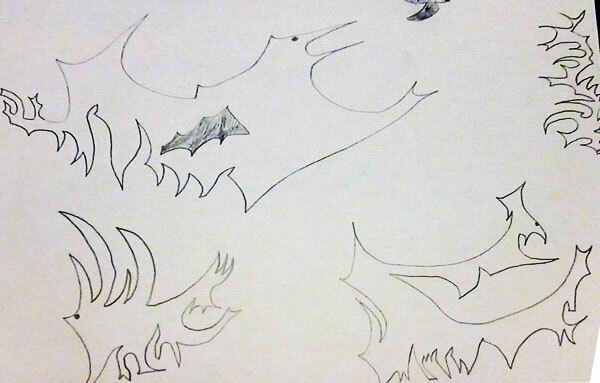 In this second picture, the one at the top left is a dragon bat. The little dark one you can kind of see at the top is a no-rain fox. The one at the top right is my favorite. He is called Lightning Run, because when he runs, he’s as quick as lightning. The bottom right one is a pteragon, which is pterodactyl and a dragon mixed. And the little guy at the bottom left is a dragon-spike fox, the taller ones are his wings and then he has two smaller spikes. 1. I was born on a Marine base. Camp Pendleton in Southern California, to be specific. (A pauper to a pawn, on Christmas Day… that’s not true.) But I have no memory of the place I was born, because we moved away when I was just a baby. 2. I have been a platelet donor since 1997. I started donating platelets when I lived in Spartanburg, S.C., and continued when I moved back to York, PA, where I’m up to 17 gallons donated to the local blood bank. Before that, I had been a longtime blood donor, but I switched to platelets because it seemed like a different good way to help people. But I like saying things that are kind of off the wall. I have a hard time being serious. 4. I was originally planning to major in computer science at Penn State. Then I realized that might actually be a lucrative career path, so I decided to take up journalism instead. 5. I was one of three co-founders of the Steve Jeltz fan club in the late 1980s. The Phillies were really bad then, and we needed something about the team to amuse ourselves with, so Jeltz (the shortshop) was it. It was a real club. 6. I like all kinds of books. I enjoy my work as a part-time bookseller and I especially enjoy getting books into the hands of people who would enjoy them regardless of whether I make any income from it. 7. My favorite director is Paul Thomas Anderson. I’m looking forward to his new film in September, called “The Master.” Right now, Tom Cruise is quietly judging me. 8. I like zombies, but importantly, I liked zombie books and movies long before they were hip, ubiquitous and trendy. I know everything there is to know about “The Gonk.” In fact, it’s my ringtone. 9. I currently have 5 cats with a combined total of 19 legs. We’re looking forward to getting more. 10. I know the last digit of pi. Note from Joan: When Chris finished, he goes, “Well, they’re unique, huh?” Uh, yeah. Sorry for that. But I purposely didn’t try to lead him OR Sarah in any direction, and this is what you get. This entry is about family, mom's journal, top ten tuesday. The previous post was Our scrapbook: Visiting the National Museum of the American Indian. The next post is The unschooled version of a seventh-grade-ish curriculum plan for 2012-13. In response to #1, I am SO throwing you a 30th birthday party. In response to your #7, it probably sounds morbid, but I want to live the kind of life that when I die, at least one person can stand up to speak about me and say, ‘she made a (positive) difference/effect/etc on my life’ and mean it. I like your life goal. That’s not morbid at all – that’s great. Joan, we are nearly the same person! I’ve not taken a single martial arts class (no.4), but I have high hopes for being in a kickass CIA fight someday. Also, I have no interest in FB games (no.8), but I zone out to ABC Family Teen Drama shows which is about the same caliber! @ Tracey…That is a great goal. I think we all hope that we have a positive impact on someone else’s life. I asked him that, and he said, “No need to clarify.” Which worries me pretty significantly. PS – He also seriously considered buying a mannequin leg at a local department store’s going-out-of-business sale. I am not kidding. I will definitely have to do a cat photos post. 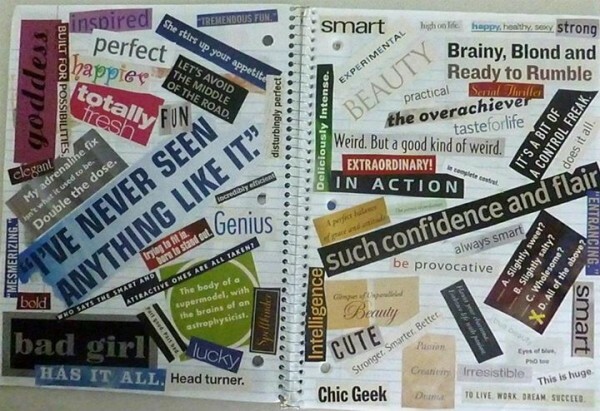 We have tons and tons – whole folders of them – so there’s not a lack of material!